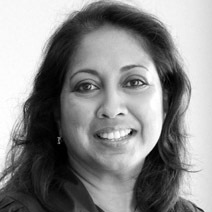 Bhanu Cruz joined the USC School of Cinematic Arts in 2012 as a major gifts officer and leads the school's parent programs. A USC alumna with a degree in Public Relations, Bhanu began her twenty-one year career on staff at USC with the Division of Student Affairs and Campus Life. After four years, she joined the Office of Undergraduate Admission where she served as Assistant Director of Admission and merit scholarship coordinator, Associate Director of Recruitment and Counselor Relations and three years as USC's Bay Area Regional Director of Admission. She joined the development team of the Dana and David Dornsife College of Letters, Arts and Sciences as an Associate Director, working with parents and regionally in the Bay Area. Promoted to Director of Development, Bhanu continued to work with parents and regionally in the Bay Area as well as manage the boards and fund-raising efforts for the USC ­Huntington Institute for Early Modern Studies, the Huntington-USC Institute for California and the West and the USC Brain and Creativity Institute. Having traveled and lived across the globe, Bhanu happily calls South Pasadena home with her husband, daughter and three dogs.